Babies love to be outdoors on a sunny SW Florida day, but a new report from the American Academy of Pediatrics suggests that changes in the skin that lead to skin cancer may actually occur in a person’s first year. However, sunscreen is not recommended for Punta Gorda children under six months of age. What’s a parent to do? SW Florida parents should be aware that infants have a much higher body surface to volume ratio than adults. Because of this, babies absorb much more of the chemicals in the sunscreen. 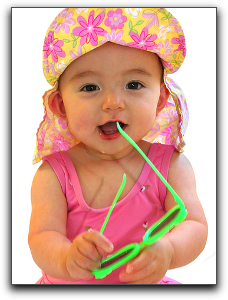 SW Florida parents should dress infants in protective clothing and hats and keep them in the shade. If needed, a little sunscreen can be used on the face and hands, where sunburns often occur in young SW Florida children. I am an independent High-Antioxidant Protein Meal Replacement consultant based in Punta Gorda. If you are interested in learning about nutritional products for your SW Florida family, contact me today.